I make no secret of what my opinion is of all the useless aquarium products that are produced and sold in the big box pet stores these days. However this one takes the cake. 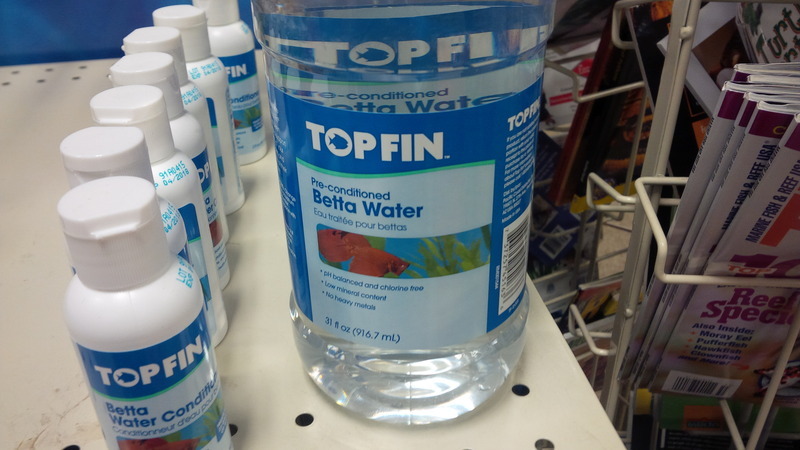 For $4.99 +tax you can buy almost a litre of "Pre-Conditioned Betta Water"
Oh brother what will they try to get people to waste their money on next. The first time I seen that in a store I just laughed and walked away. I have seen this too. Who is the ridiculous person who came up with this? Shame on them. This led me to look into some online pet store sites for betta preparations. There is quite a market for this stuff as there are numerous suppliers of conditioners, food and decorations specifically for bettas. I can also see how many new aquarists with no other source of information would buy these convenience items. If I was not a baker, I would go buy pre packaged cake mix. If I wanted a pizza, I would buy a frozen pizza. Convenience sells and to the new betta owner, guaranteeing success with buying a pre packaged solution means that you can spend time doing other things and enjoying your betta in the glass jar. @alexmtl wrote: This led me to look into some online pet store sites for betta preparations. There is quite a market for this stuff as there are numerous suppliers of conditioners, food and decorations specifically for bettas. I can also see how many new aquarists with no other source of information would buy these convenience items. True enough Alex. Convenience sells like you said, I guess anyone who has been in the hobby for a while does not think like a brand new aquarist since were long past that point.